With advances in modern aquariums it's recently bacame possible to have a piece of coral reef at home and enjoy it in the privacy of your living room without getting wet with saltwater aquarium. The aquarium has a long history and maintaining an aquarium has become immensely popular worldwide; a person who owns or maintains an aquarium is known as an aquarist. Aquaria can come in a variety of materials, shapes, and sizes. They are typically constructed of glass or high-strength plastic. Cuboid aquaria are also known as fish tanks or simply tanks, while bowl-shaped aquaria are also known as fish bowls. Size can range from a small glass bowl to immense public aquaria. A number of components are used to maintain appropriate water quality and characteristics suitable for the aquarium's residents. There are many types of aquaria, classified by the organisms maintained or the type of environment that is mimicked. Saltwater aquarium is another name for a marine aquarium. 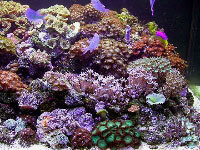 A reef aquarium or reef tank is an aquarium containing live corals and other animals associated with coral reefs. In recent years, advancements in our knowledge of the reef coupled with more refined reef maintenance techniques have allowed the reef tank to become much more accessible to the hobbyist. These aquarium setups vary from having many fish that vary from clorinating fish and spawning fish, which attempt to recreate life specific to one region of the world like the Great Barrier Reef, to the more prevalent and often spectacularly colored mixed reef that blend hard and soft corals from around the world. Unlike the marine aquarium, the main purpose of which is to house various types of fish, the true stars of the reef tank are the coral and other invertebrates. saltwater aquarium or marine aquarium is an aquarium that keeps marine plants and animals in a contained environment. Marine aquaria are further subdivided by hobbyists into fish only (FO), fish only with live rock (FOWLR), and reef aquaria. Marine fishkeeping is different from its freshwater counterpart because of the fundamental differences in the constitution of saltwater and the resulting differences in the adaptation of its inhabitants. A stable marine aquarium also requires more equipment than freshwater systems, and the aquarium inhabitants are often more expensive to acquire.